The Earth is layered in spherical layers that are very similar to an onion. These layers are defined and identified because of their chemical properties. The outer layer is made of a solid crust, a viscous mantle and a liquid outer core that is less viscous than the mantle and, a very solid inner core. 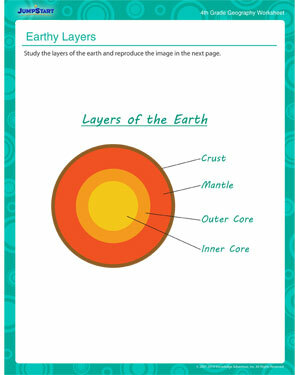 Teach kids all about the different layers of the Earth with this great free geography PDF. Browse more free geography worksheets for great practice sessions.